Who Wants a Tablet? Everybody. New SRG research suggests that the new Apple tablet will significantly expand Apple’s customer base and has wide appeal. Male to female split is 50:50, an unusual split for most technology product introductions, which tend to skew more male and younger. Current male:female split for the iPhone is 60:40 which suggests that tablet is clearly appealing to more than one market segment. 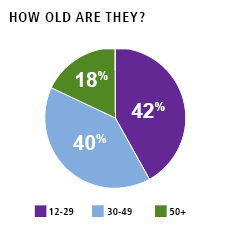 Average age of a potential buyer is 34, with 58% over the age of 30. This age profile is significantly older than the early iPod buyers as well as early iPhone adopters. About half (49%) of potential buyers do not own an iPhone or an iPod suggesting significant market expansion. And 75% of potential buyers already have a laptop which suggests that consumers seeing the utility of this form factor as distinct from and a regular laptop. Online and mobile video will likely be a stronger driver for tablet adoption than other media—interest in the device is strongest among those with those streaming TV online or watching movies on smaller-form factor mobile devices. 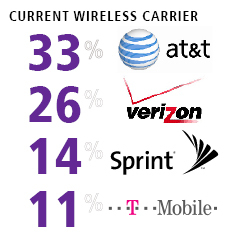 Over half (51%) of those interested are currently with Verizon, Sprint or T-Mobile; 33% are with AT&T. For a full graphic profile, take a look at this (PDF link).